There are generally two types of crabgrass that encroach on the health of your lawn: smooth crabgrass and large crabgrass. Smooth crabgrass is a low-growing annual which left to grow can reach heights of six inches. Large crabgrass is typically low growing when mowed but can grow up to two feet tall. Killing crabgrass for good involves employing proper turf cultural practices and herbicides. Lower or heighten your lawn mower's blades. Crabgrass can impede on a lawn when the grass is cut too short because the grass blades reflect the height of the grass' roots. Longer roots means that the turf can compete with the crabgrass. Grass types such as Bermuda grass should be mowed at an inch and a half, bluegrass at two and a half inches and tall fescue three inches. Fertilize your lawn at the right time. There are two types of grass types: cool season and warm season. 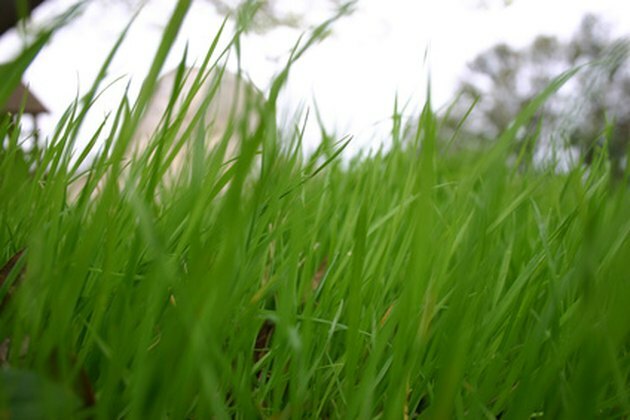 Cool season grass should be fertilized in early spring and late fall, whereas warm season grass must be fertilized in early spring to late summer. Wait for the grass to green up in the spring before fertilizing or you will encourage weed growth. Choose the most competitive grass type for your lawn. Competitive grass will prevent crabgrass from overtaking the lawn. Cool season grasses like bentgrass, bluegrass and tall fescue grass can decrease the amount of crabgrass in the lawn. Warm season grass types such as Bermuda, St. Augustine and dichondra compete with crabgrass for the soil's nutrients. Spread mulch over crabgrass to suffocate it. Use mulch types like compost, wood chips or landscape fabric. Cut the landscape fabric to the size of the encroaching crabgrass and place bricks on top to keep it in place. Apply a pre-emergent herbicide on your lawn to prevent crabgrass from germinating. Pre-emergent pesticides will not kill existing grass but will prevent the seeds from germinating and establishing.